By Costa Maragos Posted: October 13, 2017 6:00 a.m.
Matthew Vician made sure he made time to be a volunteer for What is Engineering day on campus. 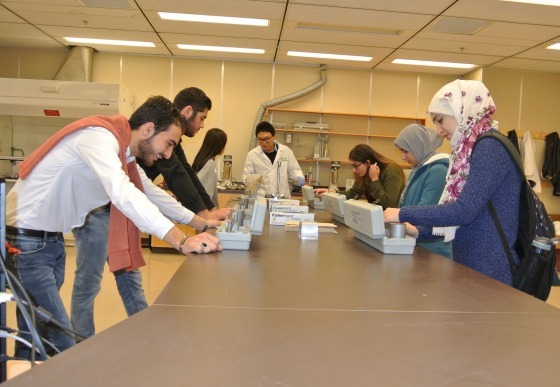 This annual event encourages high school students from across the province to spend the day on campus and to explore the wonders of engineering. Vician, a fourth-year student enrolled in Petroleum Systems Engineering, was one of many students who volunteered their time on October 11. Students visiting us from the Chief Paskwa Education Centre with lab instructor Yuan Wang. The students (l-r) Jaylene Agecoutay, Elizabeth Smallchild, Jodene Agecoutay and Letisha Kahnapace. As Vician points out, the support systems in place include engineering clubs where new and returning students can join such as the Society of Petroleum Engineers and the Oil and Gas club. The day attracted more than 100 students as well as 30 school counsellors and parents from Regina high schools and from across the province including Canora, Grenfell, Invermay, Montmarte, Moose Jaw, Moosomin, Pasqua First Nation, Prince Albert and Rocanville. 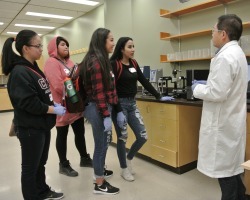 Students spent part of the day touring engineering labs, dabbling in experiments and talking with lab instructors, professors, and current engineering students. Mackenzie Buller, a grade 12 student at Regina’s Winston Knoll Collegiate, is considering a career in architecture, but she’s keeping her engineering options open. Student Mackenzie Buller with lab assistant Kewei Zhang. Mackenzie is a grade 12 student at Winston Knoll Collegiate in Regina. “It’s interesting to see how many different types of things you can do with engineering and how it’s not just one thing - you can branch out to do so many things,” says Buller. The Faculty of Engineering and Applied Science offers students opportunities in Electronic Systems Engineering, Environmental Systems Engineering, Industrial System Engineering, Petroleum Systems Engineering, Process Systems Engineering and Software Systems Engineering. Aside from the lab tours, students heard from current students and alumni about the wide array of career options available to Engineering graduates. “Our Engineering faculty always looks forward to meeting bright young people from across the province. It's an incredible way - in just one day - to introduce them to the many career opportunities in the field of engineering,” says Dr. David deMontigny, Associate Dean (Academic) in the Faculty of Engineering and Applied Science. 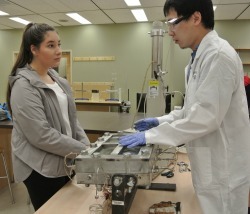 What is Engineering is an annual event jointly hosted by the Faculty of Engineering and Applied Science at the U of R and the College of Engineering at the U of S in partnership with the Association of Professional Engineers and Geoscientists of Saskatchewan.